Wanted to check in quickly before my summer travel adventures comes to an end. 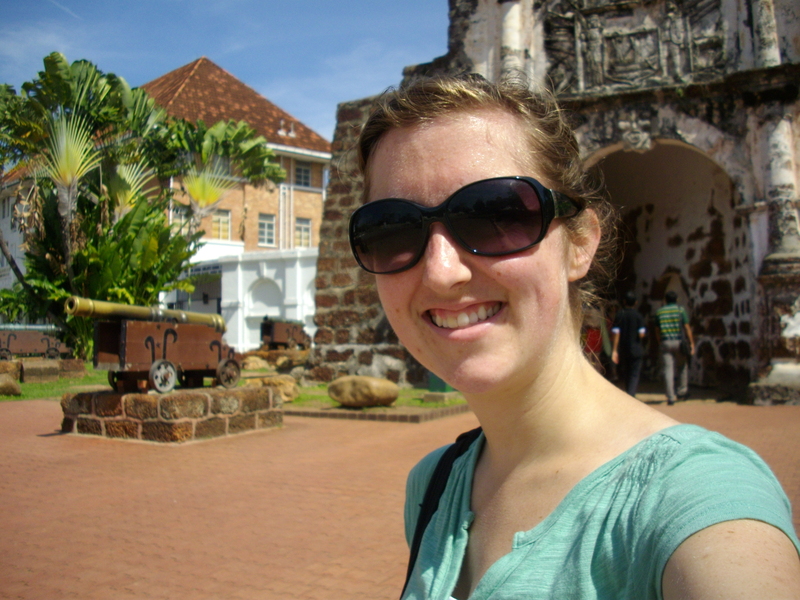 This week I had a quick excursion to Malacca (spelled Melaka in Malay), Malaysia to explore a new place for a couple days. It’s a town on the Strait of Melaka a few hours bus ride northwest of Singapore. To all you motherly protective types out there: Yes, I was careful and yes, I’m back in Singapore with my cousin and her family safe and sound now. I still have lots to see in Singapore, so I’ll hold off posting on that for now (save this one comment: Yes, I agree with what I posted previously, Singapore really is the antithesis of Cambodia). The trip between Singapore and Malacca is almost all palm tree plantations with mountains in the distance… really beautiful. I sat in the first seat on the way there and noticed that the bus driver waved to every single coach bus that was driving the other way on the highway… and there were many. I don’t think the driver on the way back was quite so diligent in his friendliness. The malls and rest areas where I was have prayer rooms designated for Muslim men and women. I met a lovely woman and her daughter from Brunei on the bus ride back and we had a great conversation where I learned all about Brunei (a country on the island of Borneo) and I told them a bit about my life as well as the Amish culture around where I grew up. It was a really fun way to spend the bus ride. I was a bit startled when the woman introduced herself and assured me that she wasn’t a terrorist even though she wore a head covering. It made me sad to think that she assumes most Americans think that way. I tried a food in Malacca called Cendol… it involves coconut milk, syrup, iced shavings, green noodley things, and red beans. It was actually quite refreshing after a hot morning of sight-seeing, though I could have done without the red beans. The river going through Malacca made for a really lovely place to walk and have breakfast. I look forward to sharing pics of it when I go through them all. Thanks for reading. I hope you have a wonderful weekend!! This entry was posted on July 13, 2012 by jennimansellphotography. It was filed under Personal, Southeast Asia Adventure, Travel and was tagged with cendol, Malacca, Malay, Malaysia, Melaka, Porta de Santiago, Singapore, travel, trishaws.